Roof restoration is one of the most popular services that Tomkat Roofing provides. Having your roof restored will not only repair any damaged areas, it will also breathe new life into your home, extend the life of your roof and add value to your home. 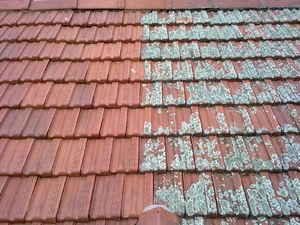 Roof restoration is an effective way to quickly improve the appearance of your roof without great expense. Or, if you’re looking to modernise and bring your home in the 21st century, the existing roof can be replaced completely – whether old tiles are replaced for new, or brand-new roof sheets are laid. Depending on the style of your home, for an ultra-modern look we can even completely replace tiles for Colorbond sheets, or vice versa. Our team’s knowledge and experience allows us to restore all types of roofs with minimal disturbance to your household. No matter what style of roof, Tomkat Roofing have the qualifications and technical know-how to deliver an exceptional roof restoration every time.